In case you’ve forgotten (no judgment), Mother’s Day is right around the corner. Lucky for you, it’s not too late to find the perfect present. 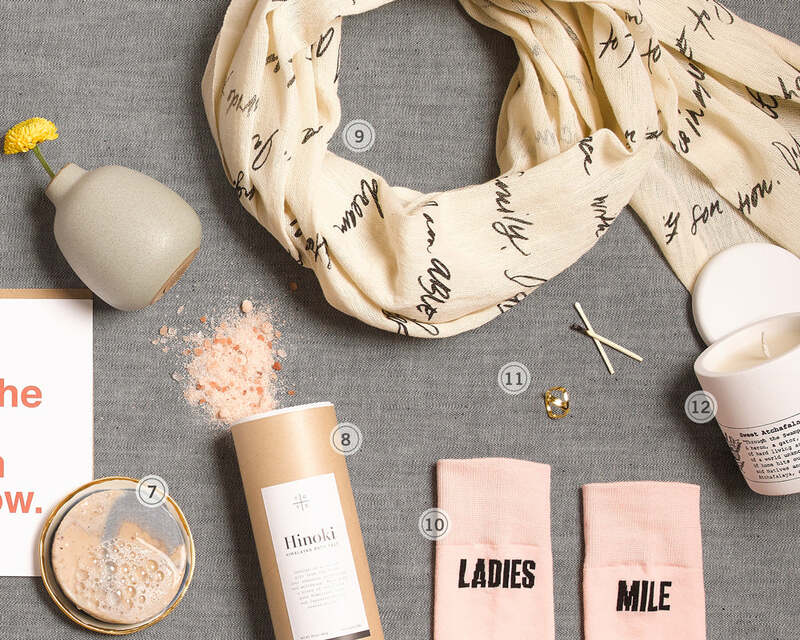 Our latest curation of conscious buys will last longer than flowers, do more good for the world, and seriously impress the moms and mamas-to-be in your life. No gift is complete – especially when it comes our moms – without a card. Keep it simple and straight to the point with this cheeky, but true handmade card from SadShop. We’re stocking up on these to send even after May 14th has come and gone. With lingering notes of pine, cedar and birch tar, this candle’s scent is inspired by the breathtaking peaks of the Appalachian Mountains. Hand-crafted in small batches and made from 100% soy wax, your mom can even reuse the white concrete jar. P.S. we loved these so much, we’re selling them in the FEED Shop & Café. 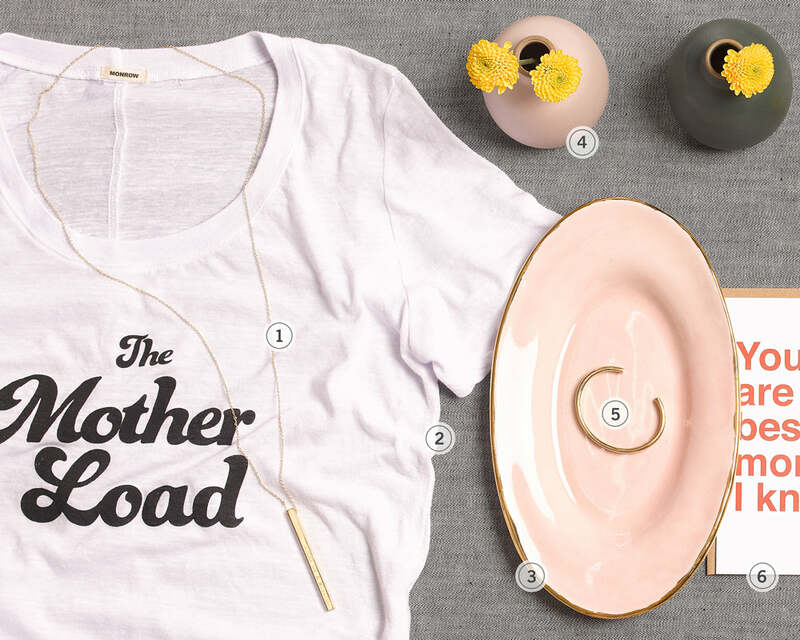 All you mamas out there will want to wear this insanely soft Mother Load tee on a weekly rotation. Our friends at goop sum it up perfectly in saying that the mantra on the front will resonate with all moms-to-be, first-time mamas, as well as the veterans driving seven-seaters. When you have to buy multiple gifts for the many amazing mamas in your life, soap is the can’t-go-wrong, affordable option. Bonus points if you give this fair trade and ethically sourced marbleized Shea butter soap from Ten Thousand Villages, which is hand-processed by women in rural Ghana. It goes without saying that your soap of choice should also smell lovely, and this one definitely does. In partnership with Soko (and their talented team of Kenyan artisans), we created two stunning pieces of jewelry, a cuff and a necklace, that your mom will not want to take off. Modern, minimal, and with a subtle (but empowering) 'woman on a mission' engraving, these are our new favorite everyday jewelry staples. Not to mention the fact that they are sustainably made, provide school meals and support artisans livelihoods, when purchased. Hand-woven in Ethiopia, the ABLE scarf makes a bold and empowering statement about what women can do (hint, anything and everything), while empowering other women with jobs. The best Mother’s Day gifts are those that help women around the globe. This bud vase set is the perfect hint of the summer season to come. We’re planning on unwrapping these and sticking a bright sunny flower in each one before gifting them to our moms. Thinking it’s gonna be a big hit. We know everyone always says that socks are the worst gift, but hear us out. These are inspired by the Ladies’ Mile Historic District in NYC, which was the first neighborhood where women could shop unaccompanied by men. Now that’s a sock gift we’d want to get ourselves. A luxurious bath, sans children and interruptions, is what every mom craves, but rarely has the time for. Hinoki Himalayan Bath Salts are the indulgent gift that she deserves, enhancing relaxation and wellbeing, and made with a blend of certified pure salts and essential oils. Throw in an hour of baby-sitting for your mom friends with littles to really give her what she wants. P.S. you can now buy these pretty salts in our store. We’ll admit that we’ve said this about our fair share of rings, necklaces and bracelets, but seriously, this is the only ring that you can wear with everything. It’s delicate, hand-crafted in Uganda, and would look equally as elegant and effortless with a t-shirt as it would with a gown. Who is more mission-driven, constantly on the go, and tirelessly dedicated than a mom? Every mama in our lives is getting our best-selling Women on a Mission tote this Mother’s Day. This platter and ring dish from Suite One are so stunning that you might actually have a hard time giving them away. Btu trust us, seeing the look on her face will be worth it. Both pieces are crafted by hand and individually textured, making each one truly unique.